The strawberry is one of the first fruits of spring. Everyone looks forward to the end of winter and to the sweet and delicious red berries. Juicy strawberries are eaten fresh or used in making juice, desserts, jam, wine and syrup. 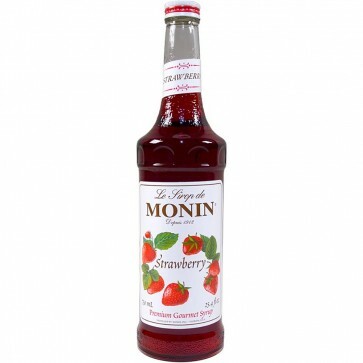 Serve the fresh delicious strawberry preserve taste of Monin Strawberry in all your beverages, any time of the year. Add a fun splash of Monin Strawberry Syrup flavor to lattes, mochas, teas, lemonades, cream sodas, flavored sodas, lemonades, smoothies/shakes, and steamers. Complement the sweet strawberry flavor with the tart taste of lemons or limes. Pure Cane Sugar, Water, Natural Strawberry Flavor, Citric Acid, FD&C #40.